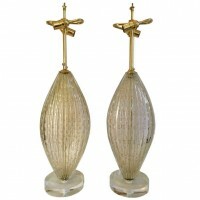 Stunning pair of large hand blown oval shaped Murano table lamps with controlled “bullicante” bubbles and gold inclusions by Barovier et Toso. Rewired with custom acrylic bases, brass double cluster on/off pull chain sockets and French style twisted rayon covered cords. Glass portion: 19″ tall x 9″ wide x 4″ deep. Overall height to top of fittings is 32″. Each lamp weighs 15 pounds. Each lamp uses 2 – 60 watt max “A” type bulbs.